For many months almost daily, I picked up my guitar and tried to write a new song. I hummed and experimented with chord progressions, but nothing came to me. Three months earlier, I did hear a rainbow song. I heard it in its entirety and even recorded myself singing the first verse. But I didn’t like the chorus. It was difficult to sing. The melody jumped down low in a few places. Most significant was that I didn’t believe my song. It just wasn’t touching enough for me. My vision was foggy and I wished I could see that rainbow. I decided that my song needed a lot of improvement and then I would embrace it. At the time my song was revealed to me, I also created an image for a story on my blog named “My Song Garden.” I used one of my existing floral paintings with a rainbow sky above. It was fascinating for me that I also chose that particular image for the cover of my first promotional CD. 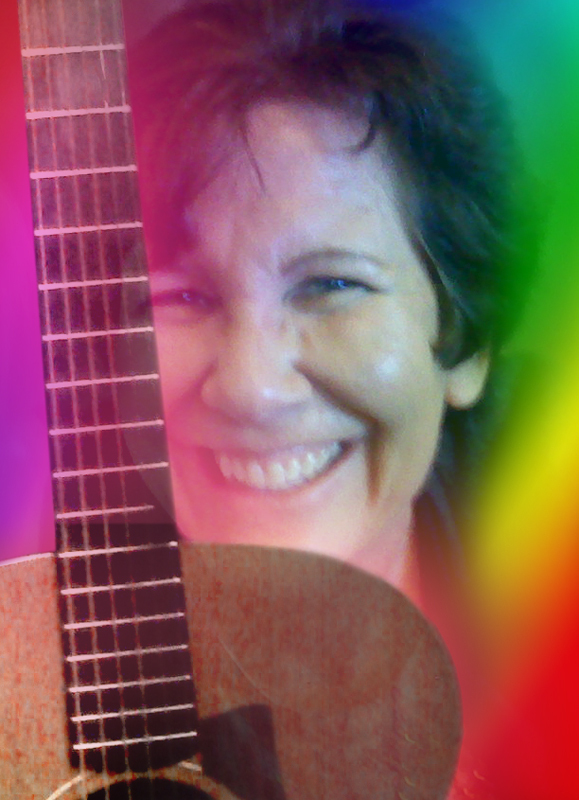 And I even created an alternate image for that CD using a rainbow and a picture of myself smiling with my guitar. My subconscious was definitely speaking to me with rainbows, but still I would not finish my song! 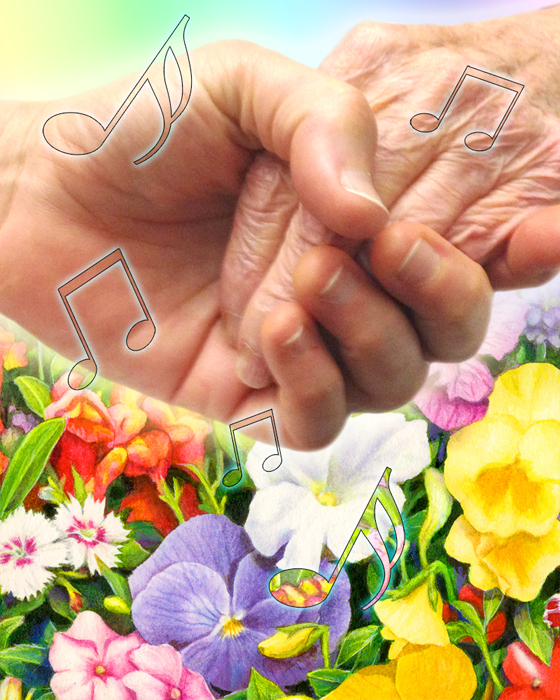 For this story, I added an image of my hand holding my mother’s over the flowers in my song garden. Her beautiful hand within mine happens to be the last picture I have of her. I took it while she was on her deathbed. I understand now that I could not accept this song while my mother was dying. 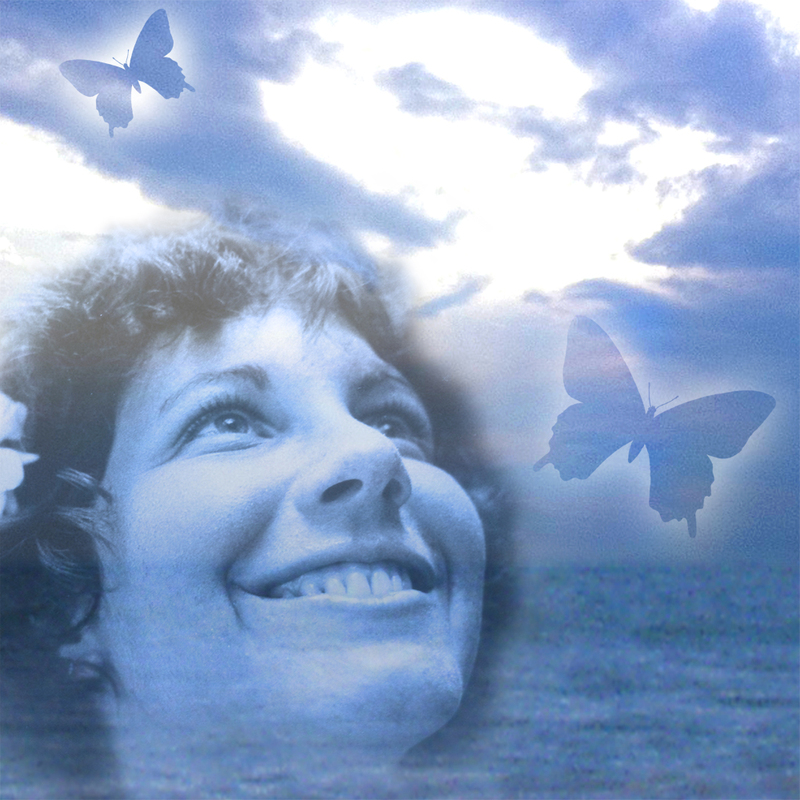 My song finally emerged two months after her death because I wanted to counter the fog and sadness clouding my vision. I didn’t want to lose hope of feeling better. 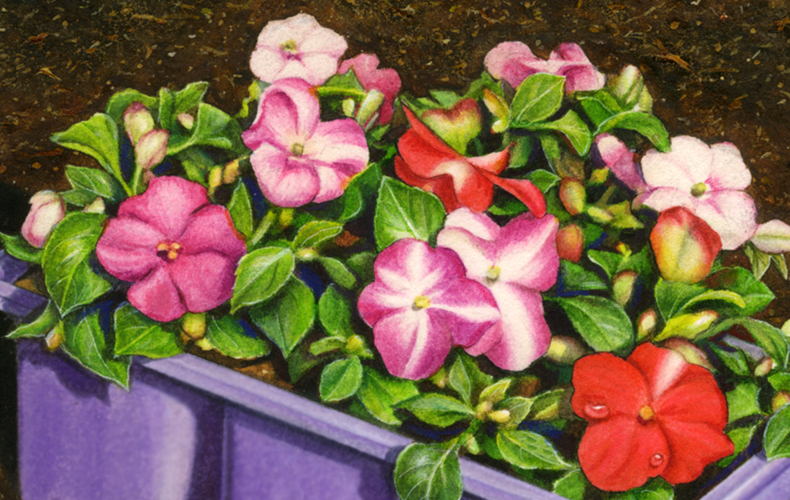 This is my larger painting that I cropped for my song garden image. My illustration was commissioned for use on a soil product package label. Both were about hopelessness. But the second line did not allow me to blame myself for my despair. 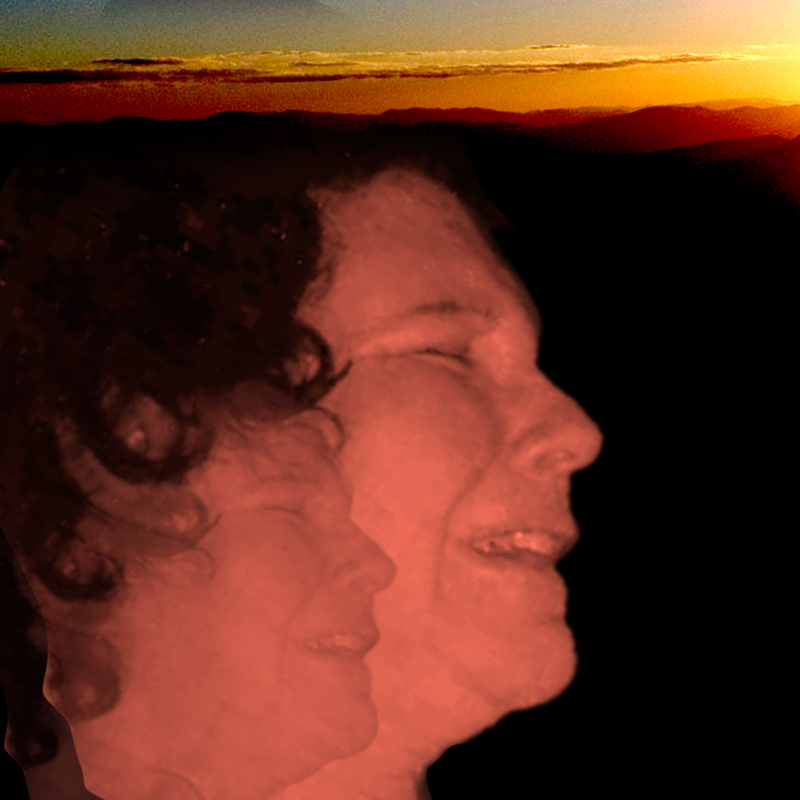 This is my image for the story I wrote two years ago named, “There Was Hope For Me.” I am twenty years old in that picture. It was no surprise that I wrote that because those words perfectly described my current life. I knew my song deserved lyrics that were sweeter, even though grief and stress definitely were “madness” in my life. But I could not find a replacement. It was because my life became increasingly filled with stress related to my divorce and demanding large children. I abandoned my song. The months went by. 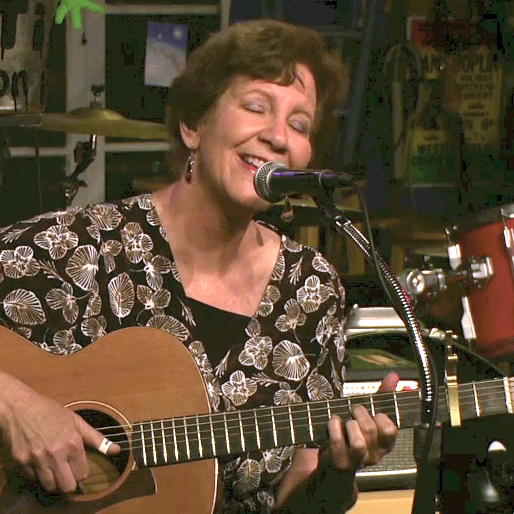 Each time I played my guitar, I felt uninspired. My arranger, George, kept asking me when I’d have a new song. Finally he convinced me that he could help me finish my song. From the moment I played the first chords for him, suddenly I felt my song magically healing my soul. I could not find enough ways to thank him. Once again, I was singing throughout my day. For a few sessions, George and I worked on the arrangement even though my lyrics weren’t set. The song truly became joyful when we added four-part harmony to the chorus. George has often told me that backup vocals add a lot to any song. Even though I sang in my high school choir, staying on pitch while singing harmony lines was quite a challenge for me! It was a perfect “bridge” because it enhanced the message for my song. That’s because I easily pictured myself praying for hope during some of my darkest moments. My artistic rendition of a story cover for “Grief 101.” It’s pretty awful to see! For me, my words and thoughts have a powerful effect upon my mood. I often try to replace words that are negative with positive ones. At a pivotal hypnotherapy session, I bemoaned how stress was detracting from the preciousness of my life. I was overeating and biting my nails again, which were familiar and unhealthy coping mechanisms. Pressure, pressure, pressure – it was too much! Pressure vs. precious were two words that sounded similar for me. Every time I felt overwhelmed by stress and pressure, I thought instead about how much I wanted life to be precious. I didn’t want joy to be squeezed out of my life! I desperately wanted to celebrate my courage and freedom. There was not a single shred of regret within me for changing my life. I decided that I did not have to suffer with circumstances that overwhelmed me. I had the power to change my life, and it didn’t stop with separation and divorce. 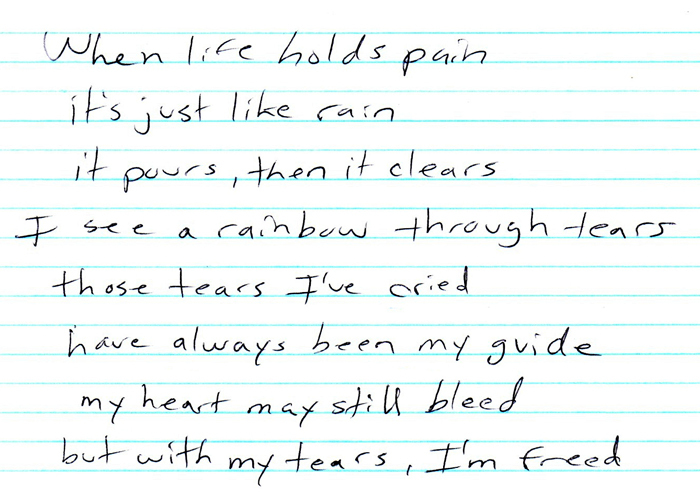 The rainbow through my tears was something I had seen before. It was important for me to remember that even if I wasn’t seeing it at the moment. When my divorce was official, I was certain there would be a huge rainbow in my life. A court date was looming ahead and no settlement was in sight. The lawyer fees for each of us were mounting. Facing my husband in a courtroom was a deeply unpleasant prospect for me. I decided to take charge and not wait for my rainbow. I searched for ideas to help myself feel better. 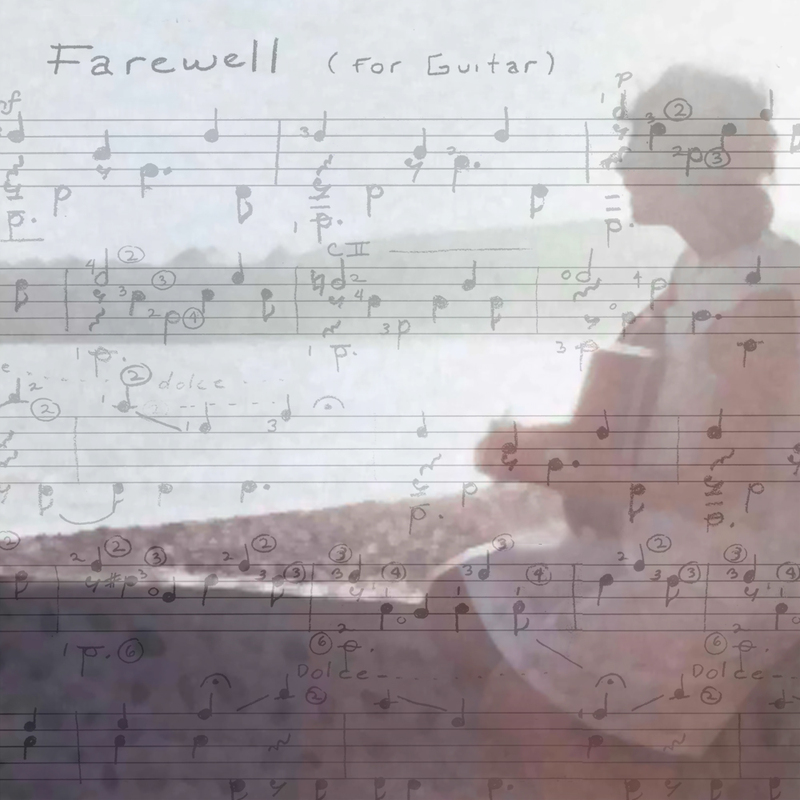 This is an image for my story cover of Farewell, a classical guitar piece I composed in college. 1. I booked a flight out-of-state to visit my former voice teacher, Peaches Chrenko. Next week I will see her for the first time in over a year. 2. The week after that trip, I am excited to meet a dear blogging friend named Sandra Callahan. Sandra is coming to California from Georgia to celebrate Christmas in Yosemite National Park. I will be taking a road trip to Yosemite with my childhood friend, Joni. I have never met Sandra. I have never taken a trip with Joni as an adult. It will be beautiful for us to relive all the childhood memories from vacations taken together when we were young children. Meeting Sandra is truly one of the most precious things I could imagine doing. Because Sandra is terminally ill, she has inspired me greatly to treasure my life even more. I am shopping to buy a classical guitar since I gave my old one to my daughter. I haven’t really played a nylon string guitar since I was twenty. I used to study classical guitar when I was in college. My eyes began to water and I honestly wondered how he could think I was glowing. I definitely wasn’t out of the darkness and in the sunshine yet. But I appreciated his words and I thanked him. Tears spilled down my cheeks. I couldn’t wipe them away because I was wearing a black plastic gown and hair color could get in my eyes. It was an awkward moment. My friend finished applying the color. I hugged her goodbye and left with a plastic hair-net on. I would rinse my hair at home. As I drove, I sang at the top of my lungs. I didn’t care if anyone thought I looked strange while conducting myself with flailing arms at a stoplight. 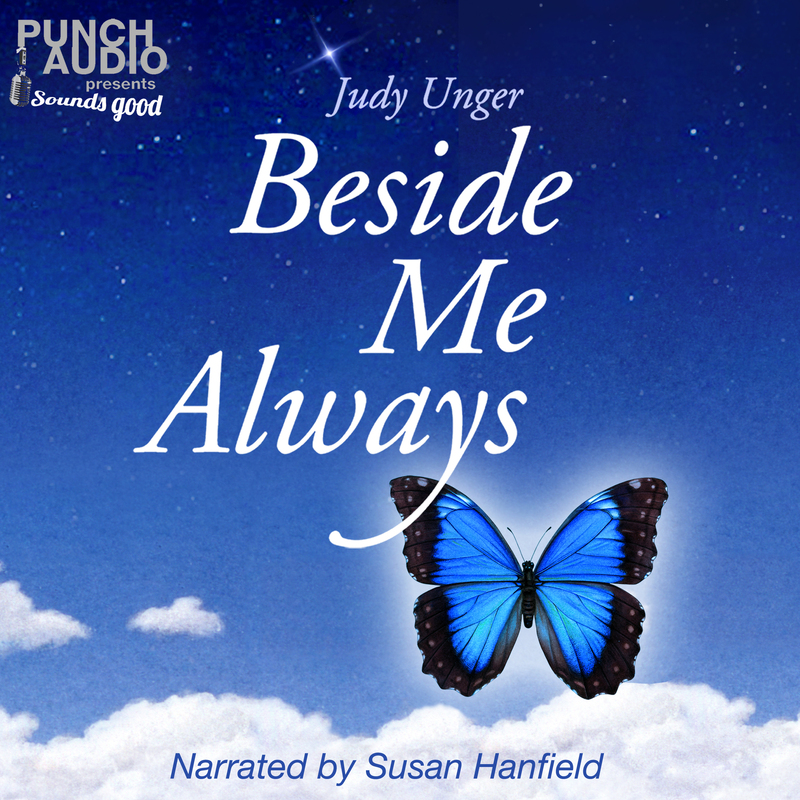 My song surrounded me with a rainbow of love, comfort and joy during a challenging time in my life. I thanked God for my jewel of a song. 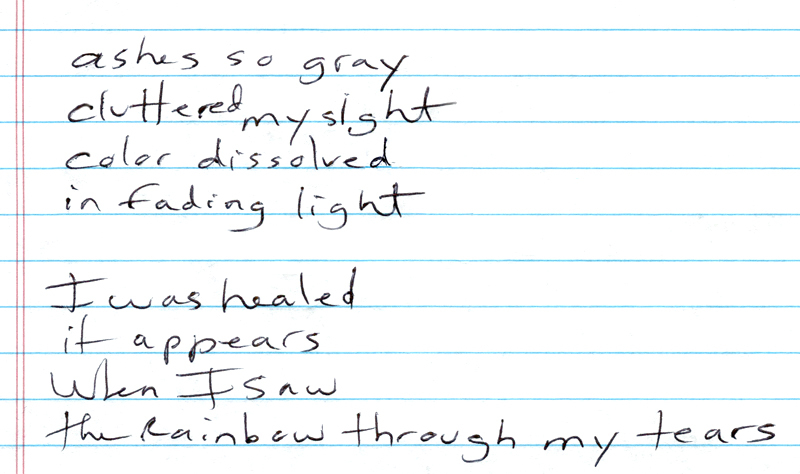 This entry was posted in Healing and Hope and tagged A Rainbow Through My Tears, acoustic guitar, adjusting to divorce, arranging music, composing, composing music, coping with divorce, coping with grief, coping with PVD, creativity, crying tears, escape through music, facing divorce after a long marriage, Friendship, god and music, gray divorce, guitar, healing music, impending divorce, inspiration, Judy Unger, living with a blindfold, loss, lyric development, lyric writing, lyrics, mother daughter relationship, Music, music and healing, music arrangements, music as therapy, musical comfort, original songs, poor communication, Posterior Vitreous Detachment, Rainbow through my tears, Rainbows, Sandra Callahan, separation, singing, song lyrics, songwriting, staying positive, suppressing feelings, suppressing tears, writing. Bookmark the permalink. Your song is beautiful! How amazing that you are going to meet Sandra!! Please give her a hug from me and take photos. Lots of photos. I so admire Sandra. Love you lots gentle Judy. i am so honored to be meeting one of my blogging friends:) i am in awe of your efforts to make the lyrics just right for your heart. not that i would think the words come easy, i just didn’t think how soul searching intense it is. your art is such a gift, all of your art. i will soon give you a real hug! Haha! I am jealous of your talent and that you and Sandra are meeting up – wish I could come over too! Love you Judy! I have decided that now is the time to live my dreams. I never said goodbye to my best friend in college before she died. I am getting a special chance now and I want to grab it – it’s in her memory.